Due to rapid industrialization and recent developments in infrastructure, commercial activities have increased in Thane over the past few years. This has resulted in the opening of various commercial establishments and corporate offices in this city. Many individuals travel to this region for business or leisure, and they always demand great food and accommodation in hotels or resorts of this city. Though it is not common to hear about a food event in Thane being hosted by a hotel, it can be very exciting to be a part of such events. There are many hotels, resorts and lodges in this city that have a class and standard of their own. But, a four-star hotel called United-21 is the finest of them all, with world-class accommodations and modern amenities. Each of the rooms or suites in this hotel is spacious and has stylish interiors. Individuals booking an accommodation in this hotel can indulge in a host of activities with facilities such as gymnasium, recreation area, spa and salon. Continuous efforts are made to improve the standards of customer service leading to complete satisfaction of its guests. This is apparent from various events that are held frequently in this hotel for its patrons. One such exciting event is being organized by this hotel which would offer a delicious treat to all its guests. This event is called Lucknowi Food Festival and it includes the best of mouth-watering cuisines from Lucknow. It starts from 2nd of November and will go on till the 11th, with 30% discount on alcoholic beverages. 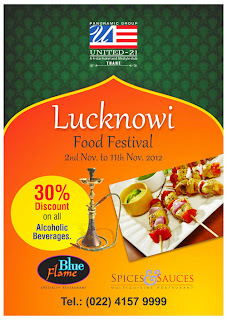 First level of this marvelous hotel would come alive with great delicacies of Lucknow. The venues for this grand treat would be a multi-cuisine restaurant called Spices & Sauces and a specialty restaurant called Blue Flame that are located on the first level of this grand hotel.